The Elicio Amphiphile platform enables precise targeting and delivery of immunogens directly to the lymphatic system, the “brain center” of the immune response, to significantly amplify and enhance the body’s own system of defenses, defeat cancer, and stop its recurrence. This substantially enhanced anti-tumor functionality and long-term protective memory may someday unlock the full potential of the human immune response to eliminate cancer. Elicio plans to begin initial patient studies in 2020 for its lead Amphiphile vaccines targeting pancreatic cancer and head and neck cancer. Size determines the fate of materials injected into the tissues. 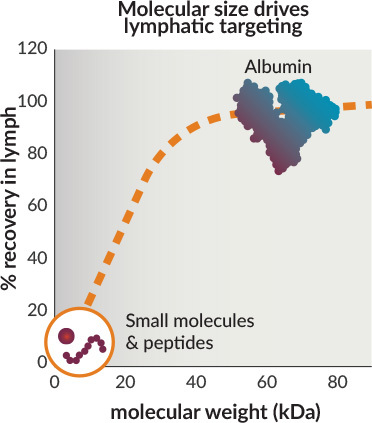 Large proteins such as albumin efficiently accumulate in the lymphatics, while smaller materials are redirected into the blood, preventing their delivery to the lymph nodes. The most abundant protein component in the tissues and lymph is albumin. Its one-way drainage from tissue into lymph vessels has been used for years to aid doctors in visualizing draining lymph nodes during surgical tumor resections. By engineering lipophilic molecules to mimic one of albumin’s natural targets (fatty acids), Elicio’s Amphiphiles hitchhike on albumin in the tissues to carry immunogens from the injection site directly to the lymph node. Once in the lymph nodes, Amphiphile immunogens are taken up by APCs to orchestrate signaling to natural or engineered immune cells in order to maximize therapeutic immune responses to disease. This strategy has been used to improve activity of immunostimulatory agents and antigens that generate little to no response when used in their conventional forms. With their flexible chemistry, Amphiphile constructs can be generated from many types of molecules known to drive powerful immune signaling. By efficiently targeting these immunogens for delivery into the lymph nodes, Amphiphiles can unlock their full potential to impact the anti-cancer immune response. With their flexible chemistry, Amphiphile constructs can be generated from many types of molecules known to drive powerful immune signaling.